Interior Trends: Love Them Or Hate Them? When Pantone announced recently that the Colour Of The Year for 2018 was Ultra Violet, 95% of my interior feed reacted with what could only be described as abject horror. A blue infused purple, it certainly wasn't everyone's cup of tea and immediately prompted discussion as to how on earth those in the know had come up with such an alternative hue. As a person who does not come from any sort of official interior design background, I was completely ignorant of the process leading to how Pantone decided on this tone. I decided to investigate. Despite the fact that you may think it looks like it's been picked out of a hat, there's a method to the madness and it's actually very interesting. Pantone, in conjunction with four or five style agencies, check current trends in multiple industries across the globe, from fashion and interiors through to digital technology and printing. When they proclaimed Greenery as the colour of choice in 2017, this yellow green signified connectivity with nature, new beginnings, individuality and the ability to look at the bigger picture (the natural world and how we can affect it). With the political world going mad, it was our instinct to seek the positive and push away the negative so it was only natural that this refreshing colour would ring a bell with the mood of the moment. This year, Ultra Violet soared into pole position. But what's the reasoning behind this? It's provocative and causes us to look twice - it's original, in your face and forward thinking. It's a shade often connected with mindfulness and creative expression. Most interestingly, purple as a colour has often been associated with counterculture movements - think Punk in the 1980's and it's use by artists such as Jimi Hendrix in the 1970's. There's no doubt that it divides opinion, but it's absolutely fascinating that this particular tone is returning to popularity during a time of political and economic upheaval. For me, purple sums up my 70's childhood when my parents wallpapered their entire bedroom (including the ceiling) in purple flock. 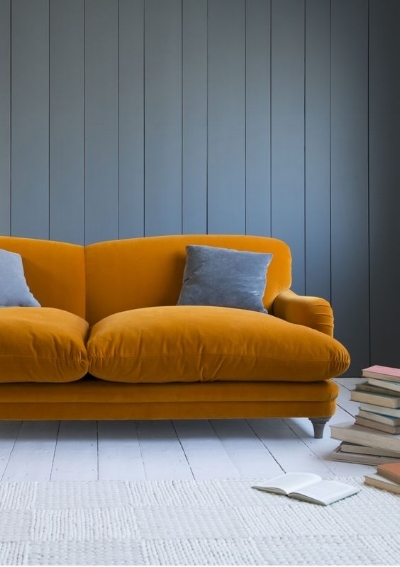 One thing is for sure - it''s going to be interesting to see how the High Street translates this colour in 2018 for use in our homes and more excitingly, how it will enter our spaces as an interior trend. But what is it that quantifies an interior 'trend'? Wikipedia describes the word as follows: 'Any form of collective behaviour that develops within a culture, generation or social group in which people enthusiastically follow an impulse for a finite period. Additionally, trends often result from an activity or behavior being perceived as emotionally popular or exciting within a peer group or being deemed "cool" as often promoted by social networks. A trend is said to "catch on" when the number of people adopting it begins to increase to the point of being noteworthy. Trends often fade quickly when the perception of novelty is gone.' Nailed it, Wiki. I loved pink and green. For two weeks. Firstly, I have to admit that I am not a person who likes the concept of 'trends'. Not one bit. Dee Campling and I run Styling Your Home workshops promoting the idea that you should only buy what you love and not be influenced by others, whether it be friends or trends. The idea that the High Street should dictate what I have in my home slightly freaks me out and as a result, I err towards vintage when it comes to my own decor. If I love it, I have it. I don't care one bit whether it's an interior trend or not. In fact, most items in my home are more than 50 years old, come from a charity shop and have a faint aura of old people (I'm not including myself in that, btw). I've been posting shots of my home on Instagram for two years now and during this period, I've seen trends come and go online faster than you can say 'macrame plant hanger'. Prior to social media, our mainline interior trends were showcased by the big brands, featured in magazines and duly followed by us as consumers. This is still the case - we are still inspired by what we see in the stores - but there's an extra layer on top of this that adds to the fun. Platforms such as Instagram and Pinterest are a hotbed of inspiration, displaying 'real' people's homes, and it can take just one disco ball in an Instagram post to have half the country scouring eBay for the same look. It's the 'Instagram Effect' and it is this that can propel an interior trend skywards. The downside of this effect is that it can also destroy it. The individuality of a purchase is often diluted once the majority of your feed has the same. From macrame to cacti through to paint colours and Berber rugs, Instagram has a lot to answer for. On the flip side, it can be very good fun. As a transient decorator who is constantly restyling, I'm always looking for new things to update my rooms and adding a hint of a trend can be a good way of changing things up. The trick is to avoid doing so much trend buying that your own personality becomes lost in translation. This occurs regularly on Instagram where before you know it, your feed starts to have an air of deja vous as a trend goes viral. I loved this chandelier. And now, I don't. So how do we incorporate these trends in our homes without overdoing it? As interior lovers, we all know it's hard not to be smitten by new ideas, colours or accessories. Last year I was totally obsessed with blush pink. A huge trend in the shops, there were blush cushions, blush fabrics, blush prints. It was everywhere. And I LOVED it. Contrasted with another trend, plant greenery, for me it was a winner and I was intent on having it in my home. So I went for it. One sitting room, four walls, every one of them pink. I loved it. For about a week. Until I realised that I made a terrible mistake. Much as I loved blush pink, I had massively overstepped the trend incorporation line. What I should have done is added a cushion. Or a fabric. Or a print. I loved the trend, but as a long term 'living with it' colour, it just didn't work for me. Two five litre tins of Valspar Blanc De Blanc later and it was all over. Lesson learned. Two years ago, heavily influenced by Pinterest, I painted the cupboards a dark blue, added a Persian rug and the piece de resistance - a beaded chandelier. Now? Graham & Green have beaded chandeliers on virtually permanent price reduction. The tell tale sign that a good trend has had it's moment. Some trends endure and some don't and it's pretty much impossible to predict. A bit like the Instagram algorithm. It's fly or die. But then if a trend flies, surely it's on it's way to going viral and dying anyway? Bloody hell, it's complicated. Anyway, I thought I'd get some clarity on this matter as to what's hot and what's not so I asked six top interior influencers which trends they love and why. Oh, and the ones that they REALLY don't. Which trend do I love? I’m excited to see the return of warm neutrals. From palest off-whites, to warmest griege, caramels, tans and everything in-between, these easy to live with colours are making a big return. After dark walls have ruled for so long, these colours feel super fresh and modern, and are so chic and uplifting. And dislike? Where shall I start? Ah, flamingos: your day is done. You were great a (long) while back when *that* flamingo wallpaper first appeared on the walls of cool members clubs around the capital, but the trend-trickle has now completed its curve and it’s time to move on. Please? I love the trend for greenery, plants and flowers (obviously) and for bringing the outdoors inside. It’s a great, budget friendly, way of bringing summer into the home all year round and they go with any decorating scheme. And what do I not like so much? I love reclaimed and vintage furniture and accessories but I’m not a fan of faux vintage - mass produced new things, designed to look battered and old. The whole point of vintage is to own a quality item with a story behind it, while at the same time promoting recycling. Fake vintage contradicts both of those things. I love the rich warm 70s tones coming through - burgundy, burnt orange and brown. In tough times we want to make our homes cosy and welcoming safe havens. Then it was pine cladding and corduroy, now it’s velvet and panelling, but the colours are similar and the sentiment the same. It’s tough out there, let’s hide at home where it’s warm and cosy. I hate copper - it’s all shiny and cheap looking and it just won’t die. But it has been looking dated for a couple of years now and it will continue to do so. Rough copper taps made from plumber’s piping are okay - that’s modern rustic. All the rest is going to be firmly fixed into the teen years of the 21st century. Teenagers are all about show and outside appearances and lots of cheap stuff. When you grow up you want to invest in more quality and style and materials that won’t date or will even improve with age. Brass does that. Silver (chrome, nickel or pewter) is a classic. Copper is for the teenage century and we will grow out of it. I love blush pink! I'm not really an overly pink girl, I would never wear blush pink, but when there is ever a blush pink and gold bit of furniture, I'm all over it. It's just a beautiful combination in furniture and homeware. I dislike boho. I have no love for Moroccan style at all. It's just personal taste. I prefer things a bit more glamorous and don't really have a hippie bone in my body! I ignore trends completely. I’ve never been interested in being told what's right, current and popular (only Punk in the small village where I grew up). Since the advent of social media we’re way more aware of trends, in the old days it was more about subliminal TV and magazine advertising and word of mouth. I refuse to believe that people buy paint/furniture/things/stuff/clothes because it's on trend - I can’t imagine being surrounded by things that are ‘on trend’ but not of my liking. Is ‘keeping up with the Joneses' still alive and well? At the end of the day though, if you love it, who cares if it’s on trend or not? The only trend I REALLY dislike is faux plants. I know some rooms are too dark for plants so a faux is used instead, but it's a no from me. I’d rather be without than have a plastic imitator that never grows or moves. Here’s the thing about trends. In 1998, I loved orange, especially teamed with lime green a la Habitat’s then summer season colours. In 2008, I wouldn’t have put orange in my house for love nor money, it was all about the organic neutrals with hints of dramatic darks starting to filter through. 2018? Oranges, terracottas (hello again Seventies style) and peaches seem to be the trendsetters colours to watch. I've just bought a burnt sienna pouffe which feels fresh and vibrant and makes me smile. Trends are fun to watch and dip into but finding your own style transcends the decades. Go with what makes your heart sing, after all, you’ve got to live with it! And me? This year, I'll be bringing in the light, banishing the dark (and the pineapples) and filling my home with things that I love, whether they are on trend or not. And I'll most probably adding a little bit of Ultra Violet into my home in one way or another. Now, where's that bar of Cadburys Dairy Milk?